Yesterday, weighed down (literally) with the excesses of Thanksgiving feasts (yes, plural on the feasts), I dragged myself away from my desk and headed out for a delightful, new experience … my first lunchtime guided walk. I knew about the walk part, but wasn’t clear on the “guided” part. How amazing to learn so much more about my fair city, taking note of history and architecture that’s been right under my nose! The weather was brisk and bright, just perfect to work off some stuffing and gravy and industrial quantities of pumpkin pie. The start of our lunchtime guided walk with SmartCommute. We move faster later, I promise. Once we start, it’s heartening to know that walking has the lowest dropout rate of any physical activity … much better than that Bikram Bootcamp Yogalates class you’ve been avoiding. What was Queen’s Park before Queen’s Park? And how close was Toronto’s first indoor pool to UHN? Yesterday’s UHN colleagues (together with Mount Sinai, Sick Kids and Smart Commute colleagues) on a “Walktober” guided lunchtime walk would know. 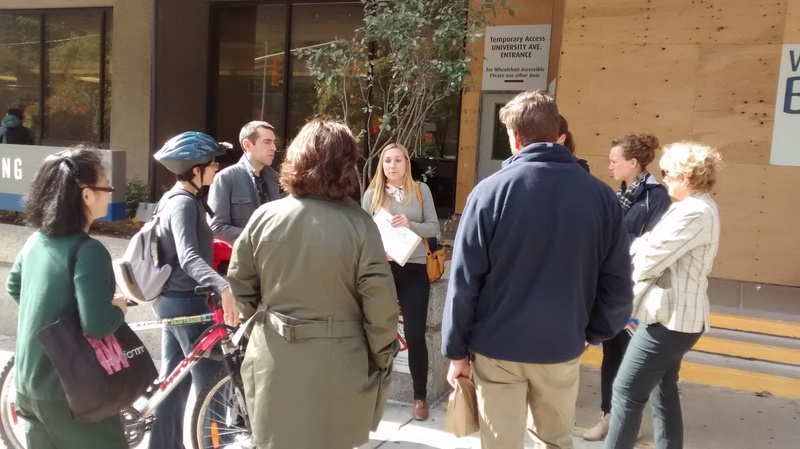 We braved the wind and traveled the back alleys and historical buildings near University Ave on a walk led by Adrienne Boyd from the Toronto Smart Commute team. Why? It’s Walktober– a month to encourage walking to and from work, during your work day and just for fun. 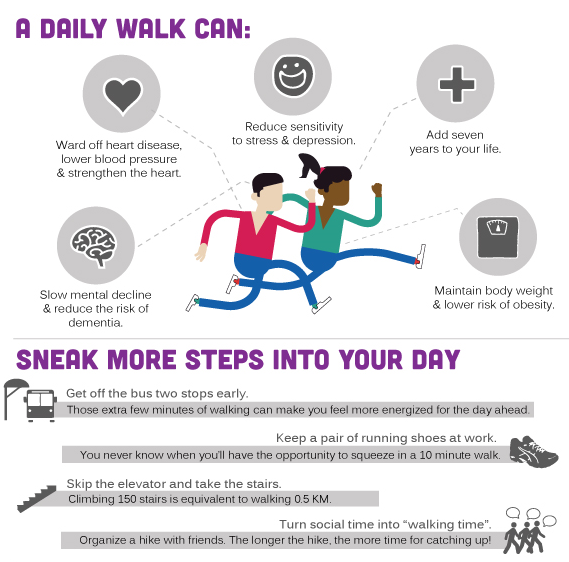 We know the health benefits (regular walking can reduce the risk of Alzheimer’s by up to 40%, can ward off heart disease and lower blood pressure, can add seven years to your life, and can reduce sensitivity to stress and depression), and we know that Health Canada recommends at least 22 minutes of brisk activity for adults a day. So a lunchtime walk can be a great way to fit this in. Why not try with a couple of colleagues? Smart Commute also challenges you to walk to work – even just part of the way (e.g. to your nearest transit station or your carpool partner’s house) –as a great way of avoiding congestion, getting healthy, saving money, reducing stress and being green! And remember if you’re worried about walking to work in case you need your car to get home quickly in case of an emergency, Smart Commute and UHN are happy to offer you the Emergency Ride Home program. And if you’re curious about how walkable your neighbourhood is, or a prospective hood, check out your WalkScore. You’ll see what percentage of errands you can walk to. Life really is better on foot. P.S. More walk/bike/run fun with the Active Switch Challenge: Oct 19 – 25. Log your trips using the tool and you could win a pair of round-trip tickets to Europe (Note, you will not be expected to walk to Europe, it’s a flight. Once in Europe, you can walk as much as you’d like). This entry was posted in Beyond Talkin' Trash and tagged active commuting, active transportation, smartcommute, sustainable transportation, walk, walking, walktoberfest. Bookmark the permalink. Hmm, I work at SickKids and did not hear about this even though I’m a dedicated reader of the internal news. Are these guided walks regular thing? This was the first one we’ve participated in at UHN, so it hasn’t been a regular thing yet. If people are interested, it could be. Your SmartCommute rep at SickKids should keep you in the know. I always send info like this out through our UHN Green Team &/or Bicycle User Group (BUG) emails, plus twitter https://twitter.com/UHNTalkinTrash and often on this very blog.